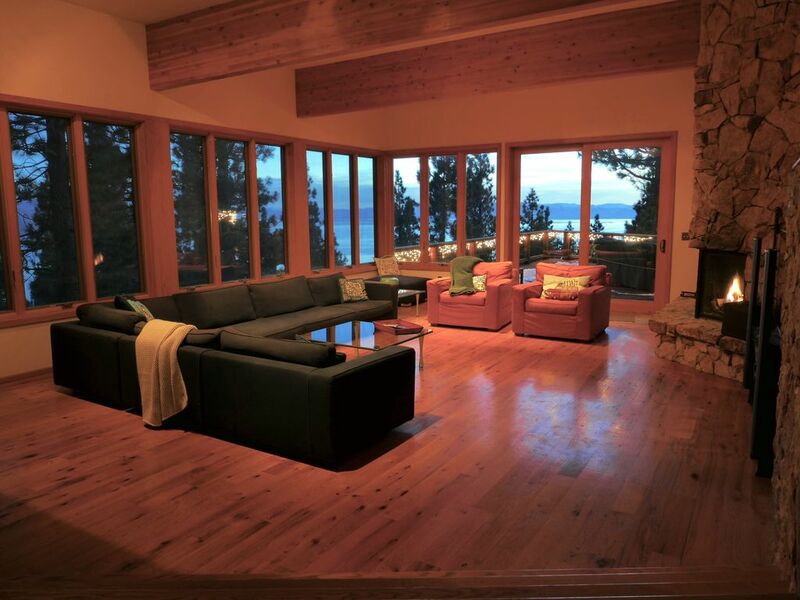 This gorgeous 3900 sq ft mountain home boasts a fantastic lake view and a beautiful open floor plan. Level entry avoids the stair climb entry of many mountain houses. An enormous deck off the great room juts out into the trees, overlooking the lake - a perfect setting for gathering, enjoying the gas BBQ and dining al fresco. The great room features a high wood-beamed ceiling, a large wood burning fireplace, wrap-around sofa and 65” 4K Sony TV with Surround Sound. The recently remodeled kitchen is fully equipped for preparing any family feast. Downstairs provides a second gathering area, with full sized pool table, wet bar with ice maker, 46' HDTV with DVD/Blu-ray, and lakeview deck. The house has a back-up generator! Stay cozy through winter storms! Please note: 3 night Minimum stay! The Master Suite (upstairs, on main living floor) has a king bed, its own deck with lake view, large bathroom with shower, dual sinks and tub. Four bedrooms are downstairs: one king, two queens and one with two sets of bunk beds. Bunk beds are both twin on top, full/double on bottom. Two bathrooms are downstairs: one with large, rain shower and dual sinks, the other with a combined shower/tub, both with heated floors. Nearby attractions: Beaches are a 5 minute drive from the house, and include Ski Beach, Incline beach and Burnt Cedar beach. Guests will be allowed access to the beaches, but will need to pay entrance fees of $12/adult and $5/child ages 6-17. Incline Village has two golf courses: one Championship course and the 'mountain' course. Both are within a 5 minute drive from the house. This is a luxury house that you will certainly enjoy. Spacious, up to date house with massive lake view living room and spacious lake view deck. Up to 10 adults won't feel crowded here. Sleeping areas separated from entertainment areas: Master suite on great room level, remaining bedrooms separately downstairs. Large lakeview deck that will comfortably seat your entire group. Abundant plush towels provided, unlimited hot water from multiple tankless water heaters. From all living areas, kitchen, decks and master bedroom . Peek of ski runs on Diamond Peak from living and dining rooms. Limited to 3 cars in driveway in winter. Bonus feature: small kids' table with 4 chairs, as well as bar seating for four. Through out living area on both floors with Sonos and. Rentable at Incline Beach and Burnt Cedar Beach - summer months only. Outdoor pool at Burnt Cedar beach. Access fee applies. Summer months only. Indoor pool at Incline Recreation Center. Access fee applies. Backup generator ensures continuous power supply. Heated driveway avoids need for driveway snow shoveling. Please note: this house is secured with external security cameras. The only property in Lake Tahoe we stay at! This is the 3rd time we've stayed at this property and we still absolutely love this property, and it is the only property we plan on staying at. There are some properties in Tahoe that aren't well taken care of, but this property is still as clean and as beautiful as when we first visited. If you are in town for skiing, this property is 4 miles/~15 mins from Diamond Peak which is great for families with young children getting their first ski lesson. The property manager is fantastic and is prompt and a pleasure to work with. I look forward to planning my next trip to this property! We had a great stay. Perfect location for skiing and heading down to the lake. House is beautiful with a fantastic view of the lake. We had two families staying and there was room to spare. This house was everything and more! We had the best time during our 4 night stay. The view of the lake was magnificent and we enjoyed watching the sunset every night. The kitchen was stocked with more than enough plates, utensils, and cups. Also had a large coffee maker, Nespresso machine, full-size oven, fridge, and stove. The bathrooms had heated floors and the showers had unlimited hot water. Nice towels and comfortable sheets made the stay extra comfortable - seriously, nothing worse than a crappy bed with crappy sheets! Full-size washer and dryer made it convenient for us to wash what we needed for multiple days of snow fun. Kids loved the room with bunk beds, the abundant amount of games and the space to play. Adults loved hanging out downstairs for an adult beverage with the pool table, especially after a full day of skiing. We felt the owners really put a lot of thought into making their guests feel at home. We are definatly renting this property again. The home was close to Diamond Peak, Mt. Rose and Northstar for skiing. We just snuck in to Tahoe during the blizzard and had an amazing weekend at the cabin. Kitchen was well stocked, the rooms/ beds were very comfortable, kids room with all the bunk beds was perfect, the bar with the fresh fruit juicer and pool table were a hit. Heated floors in the baths and the deck was stocked with fresh snow. Great location just a short ride to food and groceries as well. The Sonos sound system was great and the living room surround sound was theater quality- be sure to find the amazing Dvd collection in the master bedroom. Fireplace has a gas ignighter which was very convenient to get the fireplace started. Kids enjoyed it, adults enjoyed it...we’ll definitely be back. Highly recommended for large groups or anyone looking for a peaceful getaway. Our travel group of 11 adults and a toddler had more than enough living space, hot water, and every day necessities. Kitchen is well equipment with utensils, pots and pans for cooking, pans for baking, and tools to cook with. More importantly this home is IMMACULATE! The location is close to Incline Village (around 5 min drive) but far away for a peaceful relaxing mountain/lake vacation. The benefits of this location were not only the physical and emotional feel of the home but the fact that most of the northern locations (Ski Resorts and Northern cities) are less than an hour away. Can't imagine staying elsewhere during the winter in Northern Lake Tahoe! This was a perfect house to spend our holidays in. There was plenty of space to gather and to spread out. The views of the lake were stunning - especially after it snowed. The house had everything we needed. There was a power outage one night and the generator kicked on - quite a perk! We skied at several local resorts - the house was in a great location to get to them. Would definitely recommend.